Zuzana’s work is building a bridge between highly abstract mathematical results, such as algebraic geometry, and engineering applications. This is highly relevant for all of society. Zuzana’s work benefits engineering by offering many excellent mathematical solutions needed to develop computational techniques for applications such as Google’s and Microsoft’s 3D maps and image search. In her thesis, defended in 2013 at the Czech Technical University in Prague, Faculty of Electrical Engineering, Zuzana worked on using algebraic techniques in computer vision. The main contribution of her work is the understanding and systematic use of algebraic tools for solving systems of polynomial equations in computer vision. She constructed a number of new minimal solvers in geometry of computer vision and also demonstrated how the algebraic techniques are interconnected and how they can be efficiently used to solve practical problems. An important result of her work was the development an automatic generator of specialized polynomial solvers. With the generator at hand, it becomes possible to test alternative formulations of a problem and to search for such formulations that provide useful specialized solvers. This was not possible before, since existing computer algebra systems were always primarily focused on providing completely general solvers and did not address the issues arising when special efficient solvers are needed. Her work was instrumental in solving a number of important practical problems in camera calibration and 3D reconstruction from images. 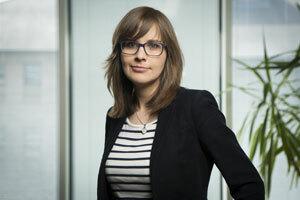 With her PhD theses, Zuzana won the Antonin Svoboda award for best thesis of 2014 bestowed by The Czech Society for Cybernetics and Informatics. In her short career, Zuzana has already presented and published an impressive number of papers at first quality scientific conferences and journals. She is also reviewer of a number of major computer vision journals and conferences. Zuzana graduated in in Computer Science at the ComeniusUniversity, Faculty of Mathematics, Physics and Informatics, Bratislava, Slovakia. She received her doctoral degree in Mathematical Engineering (Computer Vision) at the CzechTechnicalUniversity in Prague, Faculty of Electrical Engineering, Prague. She is currently postdoctoral researcher at Microsoft Research Cambridge, UK.